Jae Rhim Lee, creator of the Infinity Burial Suit. Nearly every death that’s occurred in recent past probably went something like this: After dying in the hospital, the body was transported to a mortuary, where an undertaker presented the family with two options—cremation or burial. If they chose cremation, the body was likely taken to an industrial warehouse, placed in the crematory, and reduced to ash. If the family took the burial route, the body was likely embalmed, dressed in their Sunday best, and placed in a lacquered wooden casket, which was later lowered into a concrete vault and buried beneath the preternaturally green grass of a cemetery, the space marked with a headstone. And no one at the funeral thought twice about it. That’s because, over the past 150 years, mainstream death practices have been reduced to these two options. But it wasn’t always like this: Before the Civil War, death looked fundamentally different. Dying took place in the home and under the care of family, who would prepare the body for burial, dig the grave, and place the body in the ground with nothing but a simple shroud or wooden box surrounding it. Technology changed all that. Modern medicine took death from the home and into the hospital. At the same time, embalming rose to prominence in the aftermath of the Civil War: As more and more men died far from home, doctors presented embalming as a solution to the predicament of how to send bodies back to families. What started as a pinch fix morphed into a cultural standard, and save for the rise in cremation over the past 40 years, which now outpaces traditional burial in the United States, it has largely remained that way. But reducing interment to these two options has created a host of issues. For one, death has been commodified — it’s now a $16 billion industry, often accused of price gouging and victimization. On top of that, cremation and traditional burial are environmentally disastrous: Every year, the use of caskets causes 30 million feet of hardwood, 180 million pounds of steel, and 5.4 million pounds of copper and bronze to be unnecessarily buried in the earth, according to a Cornell University study. Additional waste includes 827,060 gallons of embalming fluid, untold amounts of which enter the water supply annually. Meanwhile, cremation releases the equivalent of 41,040 cars worth of carbon dioxide into the atmosphere, according to the Funeral Consumers Alliance. In the midst of this, a new death activist movement is attempting to create holistic alternatives to burial and cremation that center on sustainability, affordability, and a closer relationship to death. And like 150 years ago, this new era of disposition is being driven by technology — and the seemingly strange possibilities it creates. Sandy Sullivan was working for a company using a new technology called alkaline hydrolysis — dissolving organic matter in a bath of hot water and a high-alkaline solution — when he had a thought: You could dispose of a body this way. Morbid as it may sound, Sullivan was right: Placing a body in this solution essentially mimics and expedites the decomposition process that naturally occurs in the ground. The difference is that at the end of the process, you’re left with nothing more than water clean enough to pour down the drain and bone that has been reduced to ash. Known as resomation or “water cremation,” this process has been billed as a sustainable alternative to flame cremation and has a carbon footprint just a quarter of that of flame cremation. 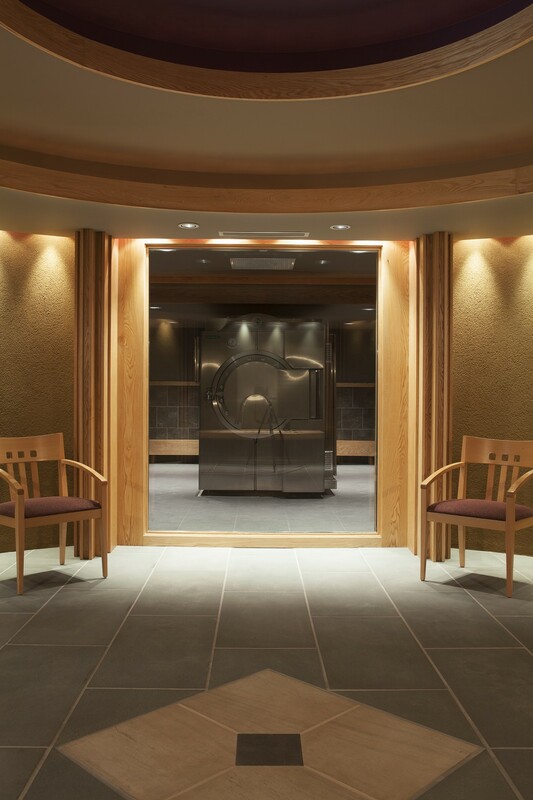 While this is what drove Sullivan to pursue resomation as an option for disposition, after installing the first unit at the Bradshaw Celebration of Life Center in Stillwater, Minnesota, he found that people were drawn to it for an entirely unexpected reason. Resomation is legal only in the United States and Canada, and only 14 funeral homes in the world currently offer it. In the United States, just eight states have legalized it — Colorado, Florida, Illinois, Kansas, Maine, Maryland, Minnesota, and Oregon — but several others are currently considering legislation to legalize it and draft regulations. Where it is legal, resomation is quickly outpacing flame cremation. Almost immediately upon installing the first unit in Stillwater, 80 percent of cremation clients (who historically made up 50 percent of Bradshaw’s business) switched to water cremation. But resomation has some competition in the eco-interment space, including a technology called promession, which is also being hyped as a green alternative to cremation. In promession, the body is essentially frozen with liquid nitrogen, vibrated into dust, and dehydrated. The ash-like remains are then buried in a shallow grave — sometimes in a cornstarch urn that is planted beneath a rose bush — where they will return their nutrients to the soil. As of now, promession is not legal anywhere, but the Swedish government is currently considering it. Promession was developed in Sweden by Susanne Wiigh-Mäsak, a biologist who felt that our mainstream burial processes were not only detrimental to the health of soil but also deprived the earth of the huge benefit all that wasted organic matter — aka bodies — could provide for regeneration. But for Wiigh-Mäsak, Sullivan, and other activists leading the death-tech movement, it’s about more than that. At it’s heart is a unique intersection between green disposition practices and a healthier relationship to death. Resomation is also built around this idea. While family members can witness traditional cremation if they choose to do so, the industrial quality of the process usually deters participation. With resomation, a tranquil viewing room is part of the deal, so families can “get better closure by seeing the final exit,” as Sullivan puts it. 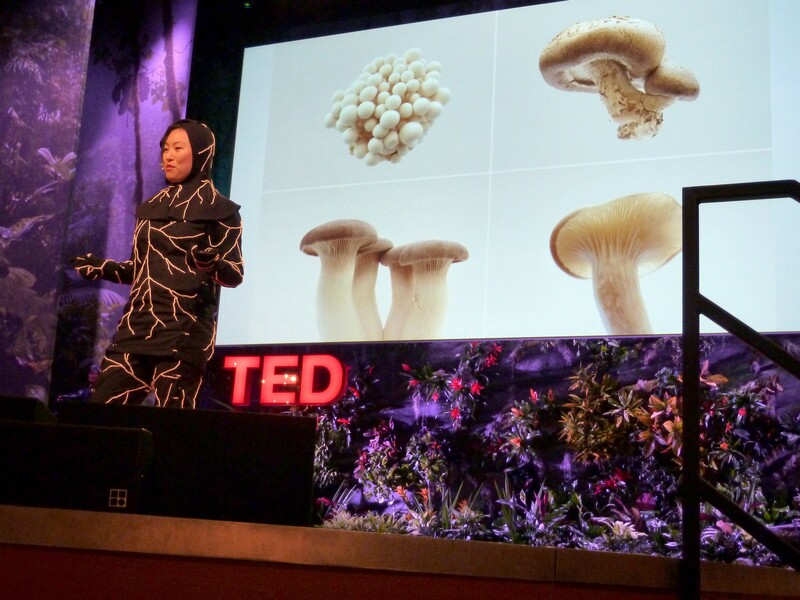 Jae Rhim Lee delivers a TED Talk in her Infinity Burial Suit. This dual approach is what drew artist and entrepreneur Jae Rhim Lee to develop the Infinity Burial Suit, a biodegradable bodysuit woven from flesh-eating mushrooms that turn a body and its residual toxins into earth-healthy compost. Like a traditional burial shroud, with the Infinity Suit, the body is wrapped in the garment and placed directly in the ground, sans coffin, vault, or even headstone. The burial suit is just hitting the market; the first body was buried in it last year. But the idea rose to fame when Lee’s 2014 TED Talk — which she gave while dressed in the suit — went viral. This hints at the biggest technological advancement pushing the eco-interment movement forward: the internet. Now, not only are people better able to educate themselves about the harms of traditional practices and be more privy to alternatives like Lee’s burial suit, but they’re also less beholden to the practices and prices of the neighborhood funeral parlor. 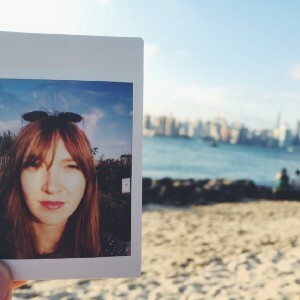 Additionally, the internet is allowing like-minded activists to connect and turn what would be individual, niche, and geographically dispersed developments into a full-blown crusade. Whether it’s liquid cremation, a mushroom suit, ash beneath a rose bush, or something yet to be invented, our corporeal afterlives are in the hands of technology. And we can only assume it will look nothing like it does today.